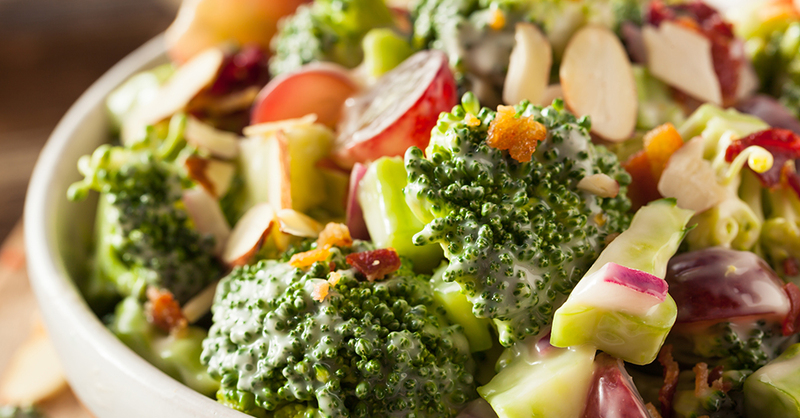 This flavorful broccoli salad is a fun alternative to chicken salad or potato salad. Even better, it’s easier to make and more nutritious thanks to the vitamins and minerals packed into the broccoli. Try it once and you may never have to fight your loved ones to eat their vegetables ever again! Don’t be surprised if your family requests this salad over and over, as the added flavors and varied textures help transform what is typically a plain vegetable side dish into the star of the meal. Make your dinners and barbecues more exciting with this simple recipe that takes less than 30 minutes to prepare…. A side salad never sounded more appealing! Cook bacon in large skillet over medium-high heat for 10 minutes, or until crispy. Combine broccoli, red onion, grapes and celery in large bowl. In a separate bowl, whisk together mayonnaise, sugar and apple cider vinegar. Crumble remaining bacon and mix into dressing. Pour dressing over broccoli and toss together. Mix in slivered almonds so everything is thoroughly coated, then cover bowl with plastic wrap, and refrigerate for at least 2 hours before serving so flavors combine.